Searching for Bonobo in Congo » Can Congo’s Forest Support Pygmy Hunter-Gathers? « In the 1970s: Bushmeat Trade Manipulates Pygmy Economy and the Fate of the Forest. 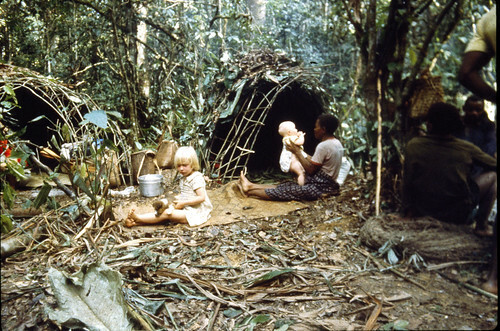 Pygmies do not now live independently in the Ituri Forest, but did they sometime in the past? For the last few centuries they have lived in a complex reciprocity with agriculturalists. The Mbuti pygmies provide meat, various forest products and other services in exchange for manioc flour, bananas, tubers and rice. No forests in Congo have Pygmies living as hunter-gatherers without a regular source of outside agricultural food. But maybe once they did? In the 1970s John lived in the southern Ituri forest and discovered just how important farm food was in the diet of the Mbuti. Eight years later we returned to the central Ituri Forest, as a family, to do the research for our PhDs. Over those 2 ½ years we examined the forest’s own ability to provide the calories needed to maintain a group of hunter gathers. Could the forest do it? Or was agriculture a pre-requisite for forest people? 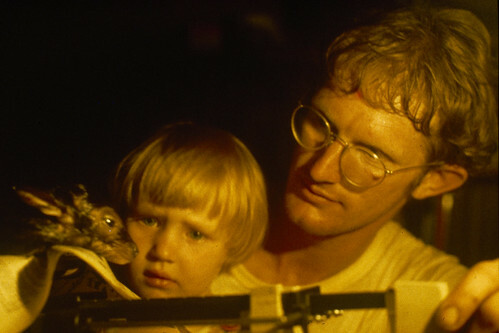 John weighing a baby duiker in 1981 “assisted” by our eldest daughter, Sarah, then three years old. Meat is currently the Mbuti’s most regularly acquired forest food. This bushmeat is mainly traded for agricultural starch. Could the meat, in and of itself, be the main caloric as well as the main protein component of Mbuti diet? 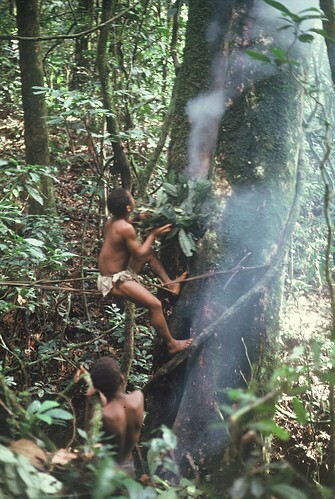 Mbuti pygmies on a net hunt in the central Ituri Forest carrying their nets between casts. Cultures that rely on animals for calories hunt animals with fat-rich bodies. In the 1920s a study found that 75% of Inuit energy intake was from fat (walrus, polar bear, whale…). If only meat low in fats is available, protein must be metabolized for energy. This is inefficient and puts a physiological strain on the body. In the early 1980s we followed net-hunters in the central Ituri Forest. We stayed 5-10 days each at 8 different camps located 6-30 miles from the village of Epulu. We followed all hunts and recorded all animals caught. One of the measurements we took was an index of antelope body fat as % of kidney covered with fat. If a carcass had more than 20g of mesentery fat, the hunter would strip it and roast it over a fire. That was rare. It occurred only during the years of high seed fall when the forest floor is briefly covered with seeds shed by the forest’s dominant trees. Results: Only one dry season did kidney fat ratio average over 40% and then only briefly, by the beginning of the wet season and for the rest of the year the average was under 15%. Mbuti have a name for protein hunger, ekbelu, separate from calorie hunger, njala. They won’t stay in the forest camps with njala no matter how many animals are being caught on the hunt. In 1983, Sarah with our second daughter, Rebekah, in a hunting camp north of Epulu. There are a number of wild food plants with high calorie content that the Mbuti always collect when they find them. Major “staple” plant foods gathered by the Mbuti in the central Ituri forest. There are at least five months, even during the years of most abundant fruiting , when there are essentially no seeds available. Some years there is little fruiting at all. Yams are less seasonal but tend to be small in the Ituri and are only clumped in relatively rare environments. 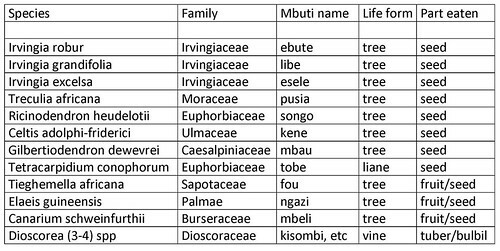 Mbau is the only food tree that is not rare in mature forest. They are the dominant tree in forests that cover sometimes many tens of square kilometers. When one flowers they usually all flower, and during the fruiting season the forest floor is littered with the starchy seeds. However the season of plenty does not happen every year and even when it does it only lasts two months, at most three. And, alas that season of plenty coincides with the ripening of other fruits and seeds and is not a bridge over a period of dearth. Secondary forests, where a garden existed from 10 to 50 years earlier, are the habitats favored by most wild food plants. Without agricultural disturbance, these trees would be much rarer in the interior of the forest being restricted to the deciduous edges of the forests and more open hill forests. Mbuti rarely move camp to be near wild food plants. There are, however, two wild foods that will cause Mbuti to move from their hunting camps or village camps for periods of days, even weeks at a time. These are honey and termites. Again these are unreliable from year to year. In the Ituri we only ate termites in one out of three years. 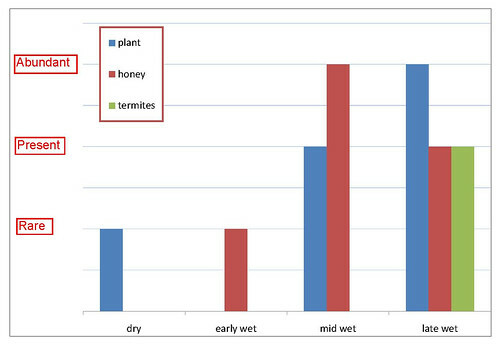 Although honey is more reliable, years of truly abundant honey are not common. Mbuti smoking out bees to take honey from a hive relatively near the ground. Usually this process happens high in the canopy. Seasonality of non-bushmeat forest foods in a year of plenty. Even in the best years, the Ituri Forest has at least five months of carbohydrate scarcity. Could the Mbuti live permanently within the closed forest before partnering with agriculturalists? Why would they? The easiest scenario to imagine is that the Mbuti lived on the edges of the rainforest, along the savanna margin or in deciduous forest. Many of the food plants are more abundant here and they would have had the option of moving in and out of deeper forest in response to availability of termites, honey or mbau seeds. Can a Hunter Change Professions at Kindu’s School for the Deaf? This entry was written by Terese Hart, posted on 2010-01-19 at 6:42 pm, filed under Bushmeat, Indigenous peoples, The Forest. Bookmark the permalink. Follow any comments here with the RSS feed for this post. Post a comment or leave a trackback: Trackback URL. I have no problem with your taking images from the posts. If , however, you use a photo that is not one of our own, please do credit the photographer. Thank you. We would, of course, appreciate a link to our own blog, if appropriate. Exist studies about elephant densities at times before let’s say several hundred years ago, when the ivory trade began, and is it possible that the elephant in high densities would open the forests in a way that it looks partly like a secondary forest, which better supports the food plants listed above? 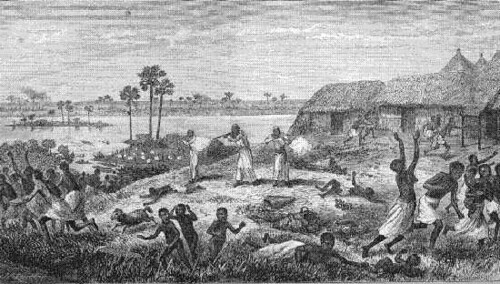 The first big pulse of elephant killing in DRCongo happened in the 19th century. So not all that long ago as far as tree life cycles are concerned. Nor was the early slaughter even throughout congo. In forests like Salonga National Park that lost its large elephant population after 1960 there are still clear elephant “boulevards” or paths and openings that were visited by many elephants seeking minerals. Within the forests, however, elephant foraging parties are smaller than on the savanna. They might maintain treefalls longer and certainly maintain some clearings, but even where elephant populations are “high” there is closed evergreen forest. The ituri forest where our study in the 80s was done had one of the best surviving forest elephant populations. It is now a reserve. Since that time half its population of elephants was killed during the conflict period of the 1990s and early 2000s. Fascinating stuff, as always, and great historical pictures. I am honored to have worked for you, even if it was very very brief, and you and John are the most dedicated conservation professionals I am sure I’ll ever meet. I have learned so much from you. I’ll continue to read your great blogs. Good to see John again in Goma, and good luck with funding and expansion of the project! Very interested with the info. for the Mbuji peope in the Congo forest. I was raised in Africa and i really miss it. Great job for this reseach! I am a breeder of Basenji dogs and have been to the DRC five times over the last 25 years to add a few native dogs to the gene pool. One trip took me to the area south of Mungbere and a visit with some of the pygmy population. Most of my time there has been with the Azande further north to the border with Sudan. I noticed while reading a number of articles on your site that there were no dogs in any of the photos. Are they not a part of the traditions in your project areas? I am currently working with a researcher investigating the origins of domestic dogs by providing DNA from native dogs. There is an interest in obtaining samples from other remote parts of the DRC. This is very interesting, Jon. In fact dogs are very much a tradition of the hunting peoples in the TL2 as well as in the Ituri, where we are familiar with the area you mention. Indeed we have a local TL2 dog as a camp pet in our Obenge camp. We will make an effort to post photographs of hunting dogs in the TL2. We would be very interested in learning more of your project, and any ways we might be able to provide information. From what I’ve read and seen about pygmies (Mbuti and Baka) is that they regularly eat (small) fish, which you don’t mention at all in the article. There is no reason to doubt (judging by their very existence) that before the bantu migration they were capable of finding sufficient nutrition, both in the forest and along it’s borders. Partnering with (and stealing from) agriculturalists is just a very efficient (easy) way to get food, and trading for iron tools also made life much easier. Like the people in papua (and all ancient humans) the pygmies probably used stone axe heads in the past, which makes chopping into wood a lot harder, but you get there in the end. One of the major factors in the ‘success’ of homo sapiens is adaptability and the pygmies are clearly no exception! Unfortunately they have also adopted the habit of alcohol abuse, like many africans who are robbed of their culture. Breaks my heart.